I had the pleasure of co-hosting a bridal shower this weekend for my bff, Schecky. We decided on a signature cocktail "The Schecky Sangria" We used 16 oz regular mouthed Mason jars with chalkboard labels (black vinyl) and used white chalk for the labels. I had read online that you could sharpen a piece of chalk with a pencil sharpener but it didn't work very well for me. If someone makes a special chalk sharpener, would have loved that. I think a white crayon would have also worked and smudged less. Burlap bar covering purchased at Michael's. For favors, everyone got to take home a mini bottle of Sangria. Custom label read: Love is Sweet, See you in December. Because the caps were orange, we covered them with burlap and a ribbon. Advice tags: we used these spruced up wish tags from Michaels and just glued some scrapbook paper to the back. Everyone was to write a piece of advice for the couple and drop them in the box. At the end of the night, we put all the tags on a key ring for the bride-to-be. As a new mr. and mrs.
Games: Our two games worked well for a bride that was very much opposed to anything cheesy. Game 1: Caption Contest. We took 4 pictures of the couple in random scenarios and had everyone write a funny caption for each. The bride then selected 1 winner for each and read some of the honorable mentions as well. People were pretty darn funny. 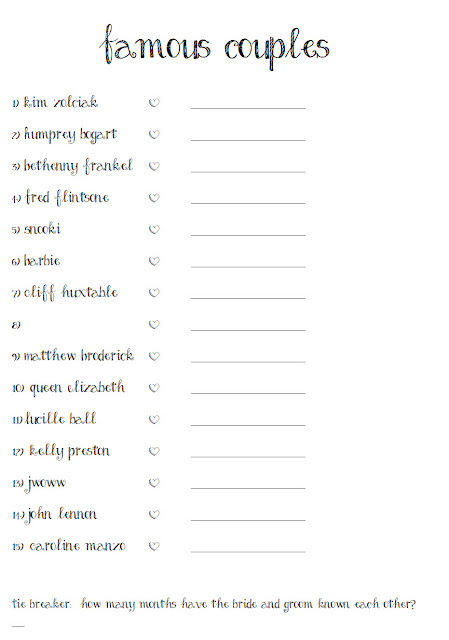 Game 2 was a famous couples worksheet. We put the groom's name as #8 and to make it a little interactive, we called out people's names to read out their answers rather than just reading the answers one-by-one. Each table had a floral centerpiece made up of 1 bunch of hydrangea and 3 roses. They were in mason jars wrapped in burlap and tied with a ribbon. M&M filled vases. L.O.V.E candles from Michael's. Scrapbook paper and a custom frame. These were plain wooden frames that I painted pink and mod podged with some scrapbook paper strips. The shower was held at Bizarre Cafe in Lake Worth. My lovely co-host Allison (Schecky's sister) and me. I loved planning this with Allison. When I would get obsessive over small details, she'd have a no-brainer easy fix for me that saved me time and headaches. I hope Schecky had the best day. I loved planning it for her cause I love her to pieces!!!! My advice I left for her on the tag which I truly mean was "Be as good of a friend to each other as Schecky has been to me over the years and you will be Golden"